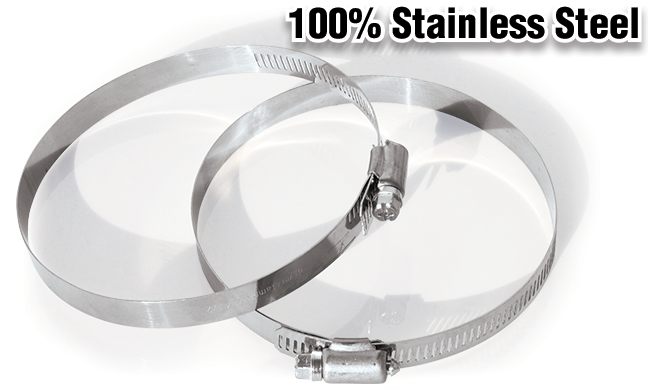 Unlike zinc coated clamps, a stainless steel band delivers noticeably smoother operation. DryerClamps open fully so you can get them around the transition duct when you connect it to the wall (other clamps don't). Their extended screw provides ample space for hex head drivers and makes power drill use a breeze. DryerClamps are built tough to help you move to the next job faster. Diameter Range: 3.5" to 4.75"
All stainless steel components ensure a super-long duty life and provide smoother operation. The exclusive multi-driver head makes projects easier without having to switch tools.